The sub-temple for Sri Yoga Narasimhaswami, facing the west, is located in a mandapam in the north-eastern corner of the firstprakaram. Yoga Narasimhaswami is also known as Girija Narasimhaswami. The idol of Yoga Narasimhaswami is sculptured according to the Sastras. He is seated with two hands on his knees, and girdled by the Yogapatta. 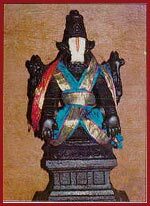 A ceremonial bath (Tiru-Manjana) is given to the idol in the sanctum on Saturdays; and on the fourteenth day of the bright half of the month of Vaisakha (according to the lunar calendar),Swati Nakshathram the idol is specially worshipped on account of Narasimha Jayanti.